The winning entry is described as a ‘knockout’ by the National Rail Awards judging panel. Ten trains were ordered in December 2010, and the first entered commercial service on November 20 2015. The order has since been extended to 17. Siemens provides operational and maintenance support, and spares, for 15 years after the trains have been delivered. All 17 will be in use before the end of 2018. There are seven Automatic Train Protection (ATP) variants and three different High Voltage Power supply systems in use on the routes the trains are either in use on (London to Brussels and Paris), or which they are to be introduced onto (London to Amsterdam), and they switch seamlessly between these systems at high speed. The e320s offer 20% more capacity than the original Class 373 trains, with 900 seats on the new trains compared with 750 on the original trains. 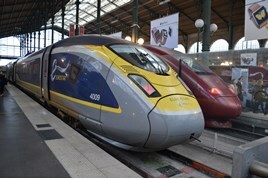 The development and introduction of the e320s into traffic has been ‘unique’ says Siemens. Testing began in Belgium in June 2013, in France five months later, and in the Netherlands in April last year. As a multi-system train set, the ‘374’ has a total mas of 970 tonnes and features a distributed power arrangement of 32 asynchronous traction motors on 16 bogies. It has a maximum of 16Mwatt power consumption when in 25kV mode. Such is the confidence in their performance, new e320s are delivered to Temple Mills (London) under their own power, rather than be locomotive-hauled as initial deliveries were. An example of their performance, is that in March 2017 the trains covered 353,256 kilometres. From their introduction until that point they had completed 8,735 journeys, covering some 4,297,620 kilometres. Since triggering the agreed performance regime, the Velaros have recorded 50% of the allowed reported failures with in the agreed specification. This falls to less than 25% of the anticipated failures in 2017. The e320 has not just set a new standard for high-speed travel, it has set the benchmark for all forms of high speed European city to city travel. With delays to the Great Western electrification scheme, Great Western Railway was in danger of not being able to deliver as per the revised franchise direct award. The plan involved switching all Intercity Express Programme electric multiple units to bi-mode trains and ordering more AT300s which meant an interchangeable fleet was possible as well as enabling areas that would have lost their direct services to London to retain them. GWR ordered new Electrostar Class 387s to cover for those that were delayed by the Class 700 deliveries to Govia Thameslink Railway, meaning a planned cascade would not happen. There were still plans for trains in the west to be cascaded and so GWR plans to create short-formed High Speed Train services and reworking Class 158 duties to ensure buses are not required. I do like the E320's. They are quieter, quicker and a reliable. The E300's Class 373's are kind of ageing. Siemens could manufacture more Class 374's. While I have no doubt the e320s are an impressive technical achievement, for me they fall well short of the comfort level in the older TMSTs and even more so, the Deutsche Bahn Velaro Ds on which they are based. The interior ambiance is poor and the seats are very uncomfortable. I can just about put up with 2 hours, but 4 hours to Amsterdam or 6 hours to Marseilles would be a tall order. Such a shame as I thought being based on the Velaro it would have a cabin at least as good as the ICE 3.